Photograph (Left to right): Sandy Smith – Monroeville Area Chamber of Commerce Executive and amphitheater steering committee member; Peggy Jaye – Public Affairs Manager for Alabama River Cellulose and steering committee member; Al Nettles – steering committee member; Charmaine Ward, Community Affairs Manager for Georgia-Pacific; Monroe County Probate Judge Greg Norris – steering committee member; John Johnson of the Monroe County Economic Development Authority and steering committee member; Monroeville Mayor Mike Kennedy and steering committee member; Monroe County Heritage Museum Executive Director Stephanie Rogers - steering committee member; State Representative Harry Shiver; Ronnie Taylor of TAG/The Architects Group and Robin Luce of JublieeScape. 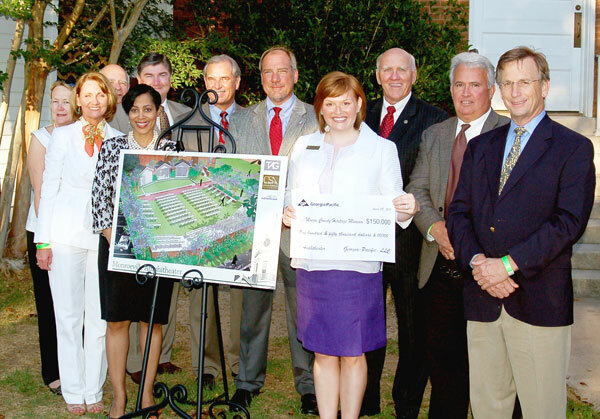 MONROEVILLE, Ala. – On opening night of the annual production of the To Kill a Mockingbird play in downtown Monroeville, Georgia-Pacific announced that it is sponsoring the construction of an outdoor amphitheater to host the play beginning in 2012. A preliminary design was revealed to patrons attending this season’s first performance, which is based on Monroeville native Harper Lee’s Pulitzer-prize winning novel. Georgia-Pacific’s donation to the Monroe County Heritage Museum, which sponsors the play, represents a $150,000 investment in 2011, with an additional commitment of $25,000 over five years for maintenance and repairs. The amphitheater will include portable seating, a courtyard, and improved landscaping for the west lawn of the historic Old Monroe County Courthouse and Museum. The area serves as a permanent location for the play and the project will enhance the site as a venue for other community events, concerts, receptions and plays. The amphitheater project is the latest addition to more than $2 million in community investments made in Alabama during the past five years by Georgia-Pacific and other companies owned by Koch Industries. Nationally, Koch companies contribute tens of millions of dollars annually through in-kind giving and direct contributions to causes and organizations focusing on economic education and educational programs, arts and culture, health and human services, community and civic causes, and environmental projects. The amphitheater project design and construction will be led by a team consisting of The Architects Group (TAG), CSA Group Inc., and JubileeScape, all of Mobile. The team was chosen by the steering committee based on a preliminary design. Construction is expected to start after the play’s current season ends in late May. Plans call for the amphitheater to be dedicated on opening night of the 2012 season next spring. Headquartered at Atlanta, Georgia-Pacific is one of the world’s leading manufacturers and marketers of building products, tissue, packaging, paper, cellulose and related chemicals. The company employs 40,000 people at 300 locations in North America, South America and Europe. Georgia-Pacific is a wholly-owned subsidiary of Koch Industries, LLC, a privately-owned company headquartered in Wichita, Kan. Koch companies and its subsidiaries employ more than 70,000 people worldwide. In Alabama, Koch companies employ more than 2,800 people directly and support 13,700 Alabama jobs in total. Total compensation and benefits in Alabama is nearly $175 million annually.